essentialtravel.co.uk - the easiest way to buy travel insurance online! Chartering a yacht may not be a cheaper alternative to a cruise but the independence is truly liberating. You are unfettered by any timetable and have only to get along with your fellow sailors. You are free to make your own way, at your own pace, stopping off at whichever mooring you choose. 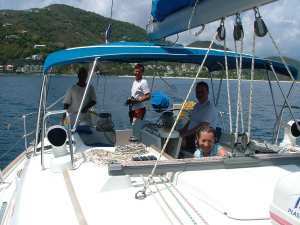 My friends and I chartered a 50ft yacht in the British Virgin Islands (BVI), yachting’s nursery slopes. The BVIs offer some of the best and easiest cruising waters in the Caribbean, not to mention some of the finest beaches. With its perfect blue waters and swathes of golden sand, this is a part of the Caribbean that really looks like the picture postcards. Surprisingly, however, the islands are still neglected as a holiday destination. Yachting often draws a well-heeled and discerning crowd but it’s a far from stuffy scene. 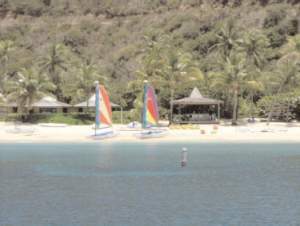 I flew from London Gatwick to St Thomas, just over an eight-hour flight, and then it was a short transfer to Tortola and the offices of Sunsail, a yacht charter company at Maya Cove Marina in Hodges Creek. In the high season, some 180 boats can be moored here, with all the boats bearing the names of fruit or animals. Our yacht - named Banana - could comfortably accommodate eight to ten but there were just five of us, plus our skipper Alden, a Tortollan who had been sailing since he was a boy. 'Bare boat' charters are possible where you simply hire a yacht without a skipper, but you really need to be an experienced sailor to do this. Ideally, at least three members of your party should be competent sailors. Besides, it’s a good idea to make use of someone’s local knowledge - our skipper was also our unofficial tour guide, telling us about the best places to dive and snorkel, beautiful anchorages, as well as the most popular local haunts. Our vessel was amply equipped: each double cabin boasted a toilet and basin equipped with a shower hose. There was also an extra shower at the back of the boat for showering on deck after a swim. You can stock up your vessel with provisions beforehand by simply completing a form on the Sunsail website - a cheaper and more convenient option, leaving just a few fresh items to be bought from local supermarkets when you arrive on the island. All your provisions are simply delivered to your yacht the next morning, ready for you to set sail. Our first morning, we had breakfast on deck, then Alden ran through the safety procedures and our itinerary, which would take us to 10 of the British Virgin Islands, all within a couple of hours sailing of each other. Each island is different and offers enough variety to keep even the most impatient holidaymaker happy. But if you tire of sleeping onboard, there are a number of guesthouses and private villas dotted throughout the islands, as well as luxury hotels. For example, the rather grand Peter Island Resort on St Peter’s Island has a lovely restaurant and hotel. And if you grow bored of your companions, there is always another boat whose inhabitants you can befriend - most tourists in the region never sleep a single night ashore. 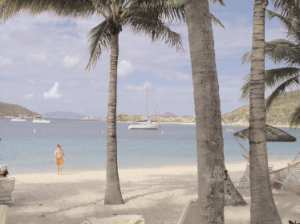 Our first port of call was Norman Island, just two hours’ sail away. We spent our first night having dinner at the wonderfully quiet, unspoilt Pirates Restaurant, where we ate delicious fresh lobster. From there, our journey continued at a leisurely pace, stopping at smaller islands such as Sandy Cay and Cooper Island to snorkel and dive. We relished the freedom having our own vessel gave us: we could stop for as long as we wanted while schools of turtles swam around us. We simply spent the evenings at local haunts or relaxing on the boat: having dinner onboard as the sun set was one of the most magical experiences of my life. Popular marinas fill up fast so it’s a good idea to have your boat moored before 5pm. Alternatively, there are a number of anchorages where you can either pick up a mooring buoy or drop anchor - taking care not to do so on a fragile reef. BV islanders are laid-back and welcoming and the region has some really good nightlife. On Jost Van Dyke, we went to Foxy’s Tamarind Bar, a beachside restaurant at Great Harbour that’s always jumping. The owner entertains diners with his poetry and, on request, will make up a racy song about whichever city or country you come from. Foxy’s plays host to a barbecue every Saturday night but usually serves Mediterranean and local cuisine such as trigger fish, snapper or tuna with a salsa sauce. The most expensive meal we ate was on Virgin Gorda at the Rock Café, so called for its dramatic boulders which make for a romantic setting. If you are keen to get away from the tourist trail, chartering a yacht is the perfect solution. It is easy to find a secluded spot where you will have a stretch of beach all to yourself. And nature lovers will be in their element: each day brings something astonishing, whether shoals of barracuda swimming past or even a whale with its young one. 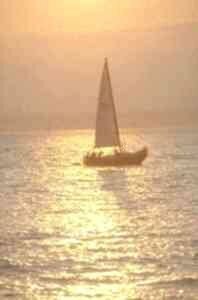 The best time to sail is from December to April. The weather, though humid, is sublime, with temperatures regularly reaching the 80s and just the occasional rainy spell. It’s best to avoid September when weather conditions can be stormy and the waters too choppy for the inexperienced sailor. At the time of writing, sailors can charter a 40-footer from Sunsail (0870 777 0318), which sleeps six in comfort, for just over GBP1,000 in April, per person per week. Skippers cost just over GBP100 per day extra. After flying to Antigua, Caribbean Star Airlines fly on to Beef Island Airport on Tortola. If you enjoyed reading the above article then you will probably also enjoy American West, also in North America, and our latest articles covering the Orinoco Delta, La Mata, Marbella and Beijing.